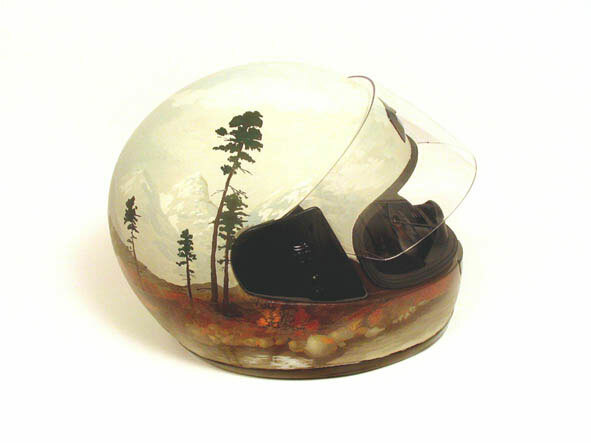 The Man of Speed’s helmet. By Juneau Projects. The beauty royale, video installation with sculpted tv, woodchipper and dowel-mounted transducer microphones. 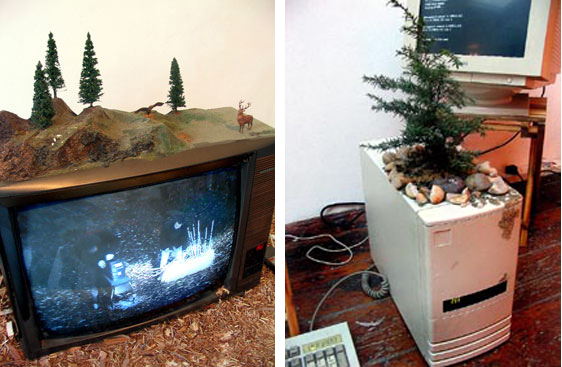 A forest, computer system with small pine tree growing in casing. Good morning captain, video installation with inkjet prints. A video of a scanner being dragged over a forest floor placed alongside printouts of the resulting scans. Mic campfire. Six microphones were suspended above a large campfire in Grizedale Forest. The microphones were lowered into the fire in turn, the sound was relayed on a pa system. A rich future is still ours. A video installation where sheets of paper with attached transducer microphones are fed through a paper shredder.